Posted on August 31st, 2018 in Dee Why. Swell faded steadily overnight and while there are still sets at the point, everyone was at Kiddies chasing waist high bumps. Wind was NNE 10-13 kts inshore and looking at the white horses out at sea, I’d say it’s twice that strength. The Bureau’s calling for 20-30 kts N-NE soon, so surf options will be retreating to the north corners. Swell’s gone a touch more to the south (158°) and was still 2.2 metres at 10.5 seconds as of 0600. Surf prospects for the weekend don’t look great, particularly on Saturday. Next week the models are showing another southerly influx but while there should be a couple metres of swell – more or less – the wind looks like being southerly until midweek. If I had to pick a day, it’d be next Wednesday… but we shall see. A high pressure system lies over the western Tasman Sea as a slow-moving cold front enters western New South Wales, preceded by strengthening northerly winds. This front looks set to bring a gusty westerly change to coastal areas later today or early tomorrow, with winds shifting southerly during the weekend as a new high develops to the west. A coastal trough is expected to form about the northern coast on Monday. North to northeasterly 20 to 30 knots tending northerly 15 to 25 knots in the afternoon then shifting northwesterly in the late afternoon. South to southeasterly 1.5 to 2 metres, decreasing to 1 to 1.5 metres during the afternoon. Cloudy. 50% chance of showers in the late morning and afternoon. The chance of a thunderstorm this evening. Westerly 15 to 25 knots increasing to 20 to 30 knots in the evening then shifting southwesterly 25 to 30 knots in the late evening. Southwesterly 15 to 20 knots tending southerly during the morning. 1 to 1.5 metres, increasing to 1.5 to 2.5 metres offshore. Southerly 1 to 1.5 metres, increasing to 2 to 2.5 metres during the morning. Posted on August 30th, 2018 in Dee Why. At 9pm last night the MHL buoy recorded peak swell heights of 5.2 metres at 14 seconds from 158°. As of 0500 it was a mere 3.9 m at 13 sec from 156°. When I grabbed the pics, t.he point looked to be well overhead and it looked too big for the beach. The Bureau’s raised the large and powerful surf warning so it obviously isn’t a day for anybody but the most experienced and fit riders. Wind was 7-9 kts from the WNW at report writing time. It should go more to the SW this morning and get up to 15-20 kts before fading back to light onshores. Swell is expected to gradually decrease over the next 24 hours. Tomorrow morning could see NE wind and waist to chest sets. Next tide is a 1.48 m high at 1035 and the 0.46 m low will be along at 1630. 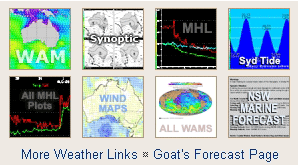 The Goat is somewhere on the other side of the world, so my reading of the outlook for next week appears to be more or less continuous onshores (but lighter in the morning) with wave heights in the waist to waist plus range. Swell peaked overnight but was still about the same size as yesterday morning. A high pressure system lies over New South Wales, while a deep low is moving across the Tasman Sea. This pattern is bringing southerly winds and a large swell to most coastal areas. Conditions are expected to ease as the high moves over the Tasman Sea later today, with winds shifting northerly behind it and strengthening on Friday as the next cold front approaches. This front looks set to bring a gusty westerly change late Friday or Saturday, shifting southerly on the weekend as a new high develops to the west. Southwesterly 15 to 20 knots becoming variable about 10 knots in the afternoon then tending northeasterly in the evening. South to southeasterly 2.5 to 3 metres. North to northeasterly 15 to 25 knots becoming northerly 20 to 30 knots in the morning then tending northwesterly 15 to 25 knots in the late afternoon. Below 1 metre, increasing to 1.5 to 2.5 metres during the morning. South to southeasterly 1.5 to 2 metres, decreasing to 1 to 1.5 metres in the middle of the day. Cloudy. 50% chance of showers from the late morning. Westerly 15 to 20 knots turning southwesterly 20 to 25 knots during the evening. Northeasterly 1 to 1.5 metres, decreasing to around 1 metre during the morning. Posted on August 29th, 2018 in Dee Why. Wind was west 6-7 kts at report writing time, but it’s expected to go more SW as the day goes along. At the same time the Bureau tells us to expect the swell to build toward 4 metres by close of play. As you can see below, the official forecast is for south easterly swell through to Friday morning. Right now most of the forecast models show conditions settling back toward flatness for Saturday-Sunday, but then early in the new week, some of them are showing another uptick – albeit with southerly wind. Have a great day and check back later because your correspondent will definitely be out and about with a camera later. Up the beach, plenty of lines. A vigorous southerly flow over the southern waters will ease today as a high pressure system extends a ridge along the New South Wales coast and a low pressure system over the Tasman Sea slowly moves east. On Thursday, winds are forecast to turn northerly and then freshen on Friday ahead of an approaching front. This front is expected to bring a westerly change to all coastal waters later on Friday and early Saturday. Southwesterly 15 to 20 knots, reaching up to 25 knots offshore during the morning. Southerly 2 metres, increasing to 2 to 3 metres during the morning, then increasing to 4 metres by early evening. Southwesterly 10 to 15 knots, reaching up to 20 knots offshore during the morning. Winds becoming variable about 10 knots in the early afternoon. Southerly 2 to 3 metres inshore, increasing to 2.5 to 4 metres offshore. Northerly 15 to 25 knots tending northwesterly 15 to 20 knots during the evening. 1 to 1.5 metres, increasing to 1 to 2 metres offshore during the morning. South to southeasterly 1.5 to 2.5 metres, decreasing to 1 to 1.5 metres during the evening. Northeasterly 1 to 1.5 metres developing during the afternoon and evening. Posted on August 28th, 2018 in Dee Why. Swell spiked up to 4 metres late yesterday afternoon and as of 0600 the MHL buoy was seeing 2.7 m at 10 seconds from the SSE (154-158°). As the pictures show, sets were into the chest plus range at the point as of 0700. Wind was light from the WSW at report writing time (it’ll pick up into the 20-25 kt range later). Tide is heading to a 1.48 m high at 0920, and then will drop to the 0.43 m low at 1510. Ocean temp is 15°C according to Beachwatch. 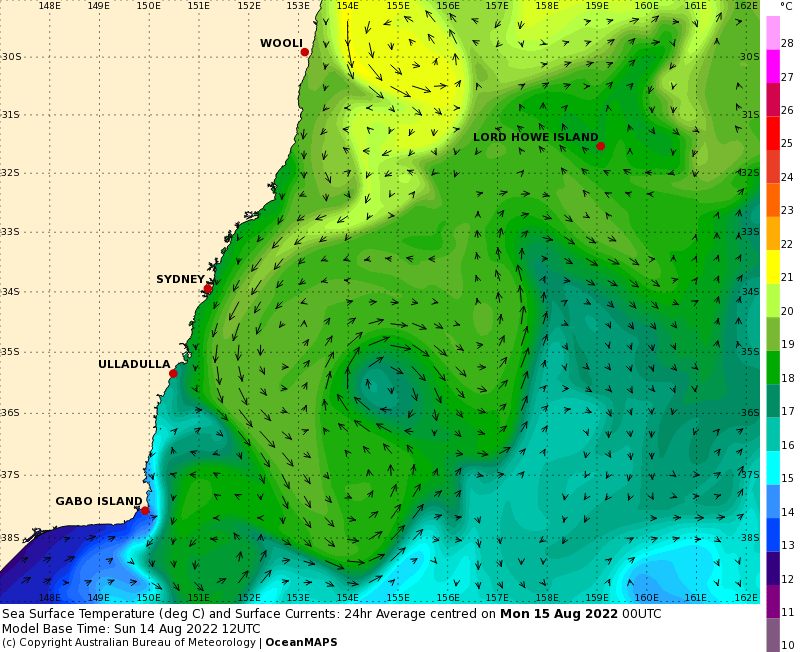 Swell forecast is looking pretty good from the Bureau – solid today, bigger tomorrow and lasting into Thursday morning. With luck there’ll still be something on Friday too. A vigorous southerly flow over the southern waters is expected to ease over the next few days as a high pressure system moves over the southeast of the continent. Southwesterly 20 to 25 knots. Southerly 2 to 3 metres, increasing to 3 to 4 metres during the afternoon. Southwesterly 15 to 20 knots becoming variable about 10 knots during the day then becoming northeasterly 10 to 15 knots during the evening. 1 to 1.5 metres, decreasing below 1 metre during the afternoon. Southerly 4 metres, decreasing to 2 to 3 metres during the morning. Posted on August 27th, 2018 in Dee Why. 15-20 kt of southerly under darkly overcast skies as the day got started. Couldn’t see anyone in the water from the crow’s nest at 0650 either. As the pictures confirm, swell conditions are pretty ordinary. The point and kiddies at 0650 – not good. As of 0500, the MHL buoy was seeing 1.9 metres of 6-sec chop from the SSE (156°). The Bureau says the swell should be coming up into the 2.5-3 metre range this morning. The Eden buoy popped up into the 2.4 metre range as of 0400, but the average period was still less than 8 seconds. So, only a slight hope for an improvement in that direction today. The wind should back off and swing more SW over the next 24 hours but I’m only cautiously hopeful that we’ll see any improvement to surf prospects unless that period stretches out into the 10-second range. Some of the models are showing the period improving tomorrow, but there is more consensus about Weds afternoon through Thursday morning when the expectation is that we could see 2+ metres at 12 seconds from the SSE in combination with nice weather and light SW-SSW wind. Our first tide today is a 1.4 m high at 0845 and then we’ll be back to a 0.43 m low at 1430. On Thursday morning when we’re hoping for the swell to pulse up, the high will be a moderate 1.48 m at 1040. A complex low pressure system in the Tasman Sea is generating vigorous southerly winds along the waters today. Winds are expected to ease on Tuesday and Wednesday as a new high pressure system develops over southeast Australia. Southerly 20 to 30 knots, reaching up to 35 knots offshore during the morning. Winds decreasing to 15 to 25 knots in the late evening. 1.5 to 2 metres, increasing to 2.5 to 3 metres during the morning. Southerly around 1 metre, increasing to 2.5 to 3 metres during the morning. Partly cloudy. 50% chance of showers this morning. The chance of a thunderstorm offshore during the morning. South to southwesterly 15 to 20 knots. Southerly 2.5 to 3 metres, decreasing to 2 metres around midday. 1 to 2 metres, decreasing to 1 metre during the afternoon or evening. Southerly 2 to 3 metres, increasing to 3 to 4 metres during the afternoon or evening. Posted on August 26th, 2018 in Dee Why. Grey skies and a rainy period heading toward Sydney as of 0830. Not enough swell to get the point going, but if there’s a little wave board in your quiver, you might get the odd knee high bump at Kiddies. As of 0700, the MHL buoy off Sydney was showing 1.2 metres of 15-sec (!) energy from the SSE (150-154°). Wind at North Head was 6-8 kts from the west. Beachwatch reports that water is a chilly for Sydney 15°C. Tide was high (1.37 m) at 0815 and will be low (0.45 m) at 1355. The Bureau tells us to expect the wind to go more northerly across the middle part of the day and although it’s not apparent on the MHL spectra, they tell us we should have both southerly and NE components in the swell. They’ve also hoisted the Gale Warning for a southerly tomorrow. From the models though, it looks like being short period junk. Tuesday could see the swell build mainly from the south, for the periods to stretch into the 10-sec range and for the wind to get more SW under partly cloudy skies. But things start looking much more interesting for Wednesday-Thursday when there seems to be a consensus among the predictions that we ought to see solid SSE swell in the head to overhead range thanks to an uptick in both the size and period. If I had to pick a day to pull a sickie, it’d be Thursday morning…. with luck the good conditions will last through Friday. Have a top old Sunday everyone! A weak trough has stalled over southern parts of the coast, generating light southerly winds. Northerly winds elsewhere will freshen today as a low over northeast NSW moves slowly east during the day before shifting over the northern parts of the coast this evening. The low will deepen as it moves further southeast over the Tasman Sea later today and on Monday, generating a vigorous south to southwesterly wind change across the waters. Winds ease Tuesday and Wednesday as a high pressure system over the State strengthens a ridge across the coast. Northerly 10 to 15 knots, reaching up to 20 knots offshore during the morning and early afternoon. Winds becoming variable about 10 knots in the evening, then tend southwesterly in the late evening. 1 to 1.5 metres, decreasing to 1 metre during the afternoon. Cloudy. 80% chance of showers. The chance of a thunderstorm, more likely this afternoon and evening. Southwesterly 10 to 15 knots turning southerly 20 to 30 knots early in the morning. Winds reaching up to 35 knots offshore in the late morning. Below 1 metre, increasing to 2 to 4 metres during the morning. Southerly below 0.5 metres, increasing to 1.5 to 2.5 metres during the morning. Partly cloudy. 70% chance of showers. The chance of a thunderstorm offshore in the early morning. South to southwesterly 20 to 25 knots. Southerly 1 to 1.5 metres inshore, increasing to 1.5 to 2 metres offshore. Posted on August 25th, 2018 in At large. A steady NE wind, overcast skies dropping the occasional drop of rain but only a feeble and scrappy little SSE-NE combo swell making itself felt along the beaches this morning. The MHL buoy was seeing 1.7 m at 10 seconds, but I didn’t see too many wave faces in that range when I checked conditions around 0730. Tide wasn’t a big issue as the 0740 peak is a modest 1.3 m. It’ll be back to a lowish 0.48 m at 1315. Water temp has dropped to 16°C. Wind should pick up later in the day, while the swell seems unlikely to improve in any respect. According to most of the models, outlook for the week ahead is not red hot for Sun-Tue but Weds-Thr looks hopeful on a couple of the predictions. Have a top old Saturday! A high pressure system lies over the western Tasman Sea whilst a low pressure system and associated trough lie over the far northwest of the state. North to northeasterly winds will freshen as the low moves east this weekend. Late on Sunday winds are forecast to turn southerly along the southern half as the trough moves into the Tasman Sea. Southerly winds are then expected to extend along the coast during Monday as a complex low pressure system forms over the Tasman Sea. North to northeasterly 15 to 20 knots turning northerly during the day. Northerly 15 to 20 knots, reaching up to 25 knots offshore in the late morning. Winds shifting west to southwesterly in the evening. 1 to 2 metres, decreasing to 1 to 1.5 metres by early evening. Cloudy. 80% chance of showers. The chance of a thunderstorm offshore in the early morning. West to southwesterly 15 to 20 knots tending south to southwesterly 15 to 25 knots during the morning. Southerly 1 to 2 metres. Posted on August 24th, 2018 in Dee Why. First day back from my mid-north coast jaunt and things look pretty quiet at Dee Why. It was hard to see much from the crow’s nest but after processing the pics it looks small and weak. The MHL buoy recorded 1.3 metres of 10-sec SSE (156°) swell at 0500. That’s down a touch from yesterday, so if you found waves on Thursday, head back there this morning. Wind was ENE at 4-5 kts as of 0745 and according to the Bureau, it will continue from that direction as it heads to 10-15 kts or so later. At the same time, the swell is set to decrease. Yeah, great. Tide hit a modest 1.3 m high at 0700 and will be back to a 0.5 m low at 1230. As for the outlook, well it’s Friday and we therefore have the Goat’s outlook to examine with the morning coffee. He’s going into postcard mode for awhile, so it’ll be over to your correspondent to try to uphold the standards in the interim. Go well with your Friday one and all! Posted on August 23rd, 2018 in Goat's Forecast. Forecasts may be intermittent for a little while… depends whether there’s access to wifi wherever I am and whether I’ve got the time to do a forecast or send a postcard while I’m having fun! Will obviously check in from time to time to see who our Prime Minister is this week. In the meantime… the swell is still hanging in there at pretty much dead South 2-3 metres offshore, mostly going straight past but with enough of a period for it to be getting into the places that like that kind of thing….though is starting to turn a little more South East, so more will start to come in. And it looks like there might be a few drops of water falling from the skies over the coming days… but not enough for the farmers unless there’s more to come later. Thursday: in the 1-2 metre range East South East, but more coming ashore. Sad news about Bob, a regular at Little Av, which is never a wave for the faint hearted. Woo…it’s gone down from 17 off Sydney at the weekend to 15.7 — which is decidedly chilly on my scale. With some Noreasters forecast over the weekend it could get even chillier. Forecast issued at 4:20 pm EST on Thursday 23 August 2018. Partly cloudy. Slight (20%) chance of a shower along the coastal fringe late this evening. Light winds. Partly cloudy. High (70%) chance of showers along the coastal fringe, medium (50%) chance otherwise. Showers becoming less likely in the evening. Light winds becoming east to northeasterly 15 to 25 km/h in the early afternoon. Cloudy. Medium (60%) chance of showers. Winds northeasterly 15 to 25 km/h. Cloudy. Medium (60%) chance of showers. Winds northeasterly 15 to 25 km/h becoming light during the morning. Partly cloudy. Slight (30%) chance of a shower, most likely in the afternoon and evening. Winds south to southwesterly 15 to 25 km/h. Partly cloudy. Slight (20%) chance of a shower, most likely during the morning. Winds southwesterly 15 to 25 km/h. Partly cloudy. Light winds becoming west to southwesterly 15 to 20 km/h during the morning. Posted on August 23rd, 2018 in At large. On the Pacificc Highway headed home as I write this. Got up this morning to find the point at Crescent Head just flickering. There wasn’t anything at the top of the point, but out from the clubhouse the SUP riders were dominating the occasional waist high waves. Decided to look in at North Haven on the off chance there’d be something interesting. No one in the water and a few locals messing about in the carpark told the story. The open beach had waves, but no discernible peaks and up next to the breakwall there were occasional little sections, but they were very few and far between. Bonny Hills mal waves with the odd interesting one. Around lunch time we pulled off the road for a look at Old Bar and the point. The open stretches were just starting to blow out and the point was pretty small (again, the SUPs had the best of it). We did see a spectacular Regent Bowerbird, but of course the camera was not to hand.